This entry was posted in Web Log Storming on November 2, 2011 by vradmilovic. As mentioned before, in 2009 we switched to subscription based upgrade policy. By buying a license or subscription extension you get free updates for one year. After that, you can continue using the last version you own (forever or for time being) or extend subscription right away. Because we wanted you to get used to this idea, we prolonged an implementation for a while, but now it’s time: version 2.6 won’t work if you bought your license before Sep 27, 2010. If you update to v2.6 accidentally and you don’t wish to extend subscription, please bear in mind that this wasn’t our intention at all and that we took all reasonable measures to avoid such misunderstandings (blog, newsletter and a warnings throughout the application). In that case, you can download latest “last free for all v2.x customers” version from here. Most important tangible change is introduction of Bounce rate metrics; now you can see how much visitors leave after visiting just one page. This metrics is included in the Overview report, but also on pages, referrer and search keywords reports. This way you can easily see how well specific page or referrer is performing. Another important change is eliminating problems with Windows 7 64-bit. The problem didn’t happen on all systems and it was related to a third-party software protection system that we were using in combination with some anti-virus/firewall software. Well, it shouldn’t happen anymore, and if it does, by all means, please let us know. If your old registration data isn’t automatically updated, please try to enter your key again. We also updated Operating System and Browser lists and fixed some cosmetic and minor bugs. Several days ago we finally created a Facebook fan page. It still doesn’t contain much information and we are now awaiting more “Likes”. So, if you already like Web Log Storming, why wouldn’t you make it official? 🙂 In return, you will get a 20% discount for any of future purchases related to Web Log Storming (which includes new licenses and subscription extensions). This offer probably won’t be here forever, but once you get your coupon you will be able to use it anytime, so make sure you don’t miss it. This entry was posted in Web Log Storming and tagged analytics, analyzer, software, statistics, web on September 27, 2011 by vradmilovic. After traffic starts coming in, Web Log Storming will be able to analyze this information and include it in reports. Easiest way to this is to enter “adw=*” into Parameters | File | Query field (note there is no question mark here). You can also use Lock button to keep this filter active as you switch reports. While this parameter (filter) is active, any report that you select will be based on AdWords visitors only, making it easy for you to see how they perform. Another tool that you might want to use is View | Based on IP only main menu option. If you select it, sessions from the same IP will be grouped as one, allowing you to examine it as a returning visitor. If you use Professional edition, you can also define Goals important for your business. Please read this article to learn how to do that. As you can see, for each defined AdWords destination URL (campaign, group or ad), you get metrics that show how they perform against specific goals. 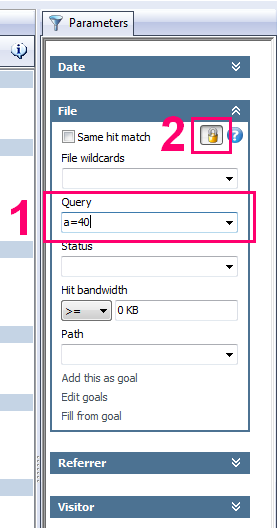 In this example, campaign Test1 works perfectly for Goal2, while Test2 works better for Goal1. Anyway, we are all probably sure that less people use proxies these days than few years ago, more people are on a broadband with fixed IP addresses and more people intentionally block cookies and analytics scripts. In other words, try this and you might be pleasantly surprised. This entry was posted in Web Log Storming and tagged adwords, analytics, analyzer, software, statistics, web, web log analyzers on June 1, 2011 by vradmilovic. As you might know, we have released Web Log Storming v2.5 a day ago. This post is a follow up that explains few important changes. Even though we’ve switched to optional yearly update policy starting with v2.0 (as it is and was indicated on the purchase page), we have decided to prolong activating it for a while. Main reason for waiting was to give you, especially to v1.x users, some additional time to get used to the idea. Of course, in case you decide to extend subscription months or years after the original one expired, your new free updates period starts from the date of the new purchase. On the other hand, if you decide to extend it before current one expires, new period will not start until the original expiration date. Important: as version 2.5 is the last version that will be free forever for all v2.x users, we strongly suggest you to install it. If you often use View | Human option, you might suddenly notice dramatically reduced number of visitors. Don’t worry, it doesn’t mean that your business is going downhill. 🙂 We’ve implemented smarter algorithm to detect which visitors / domains are behaving like spiders. It would be easier for analysis if spiders and bots followed few simple rules: introduce themselves as such in User agent field, read and respect robots.txt file, etc. Although some do (like Google, Yahoo and similar legitimate spiders), some don’t care and/or are trying to full us in different ways (“referrer spam”, for example). This more advanced algorithm tries to figure out if certain domains and visitors don’t behave like human beings. For example, if you get lots of hits on small number of different files from a single domain on regular basis over the time, it’s most probably a bot. Of course, exceptions are always possible (false negatives and false positives), but we think that we’ve managed to reduce mistakes significantly compared to previous version. That said, if you notice some obvious false positive/negative, feel free to let us know. We will analyze these sessions and see what we can do to improve the detection further. This entry was posted in Web Log Storming on April 22, 2011 by vradmilovic.